I was planning on holding this stuff back until the "Art of Iron Man" book came out (come on, you want there to be some surprises!) but it looks like thanks to the internet once again the cat's out of the bag. A bunch of stuff got posted to Yahoo Movies, including these three images I did at the very end of production as alternate suit designs that would have been in a "Hall of Armor" coda at the end of the film. This first one is a concept for War Machine. I spent a lot of time on developing this suit, which was of course cut from the script about half way through pre-production. 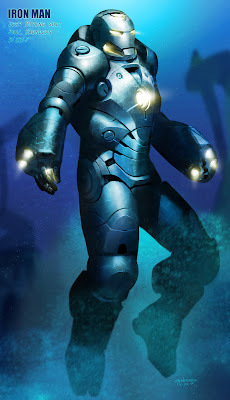 Originally it was going to be called the MK IV armor and would have been weaponized swap-out parts that would be worn over the original MK III armor. Earlier versions were red and gold, and would have been worn by Tony Stark in the final battle sequence. And for those of you speculating, sorry folks, as far as I know, if there is a War Machine in IM 2, it's unlikely to be this one. You'll just have to wait and see! This next one is an attempt at suggesting "stealth" technology in the surface treatment of the suit. This was an idea that was played with early on in the MK 3 development, but was ultimately abandoned as not being classic enough. I revived and updated it for this special purpose suit. This last one has a funny history. Throughout pre-production, every time we would present our designs for the suit, Avi Arad, the film's producer, would ask us for an underwater suit. Now I should mention that there was never an underwater scene in the script, but as the toy licencing is such a large part of the revenue from these films, there was a lot of pressure to use as many variations on the suit as possible in the film, all budgetary condsiderations notwithstanding. Needless to say, the underwater suit never saw the light of day, but in homage to Avi, I drew this one up as a possible addition to the hall of armor. The War Machine concept is fascinating one. Perfectly design. 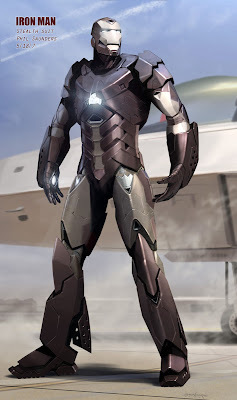 I sure hope for the production crew for the sequel to use the concept of modular weaponry on the Mark 4 armor. I look forward to the release of the book and maybe one day meet you at a con *cough* Dragon Con *cough* and get it signed. Great to see all this, Phil. When will the "Art Of" book be coming out? Holiday season..? I'm in awe of your work man! Your iron man stuff has inspired me to redesign robocop so I can draw awesome robots too. 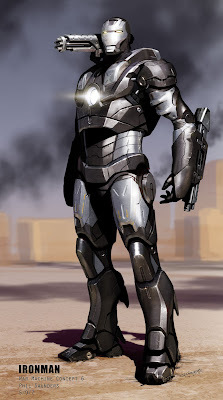 great job, a hope war machine appear in the second movie, and we need a book with the art from the film!!!! Hi, I bought The Art for Iron Man artbook. Saw some of your work featured there. The book's great! The artbook I have seem to have a different cover than the one shown on Amazon. There are different editions for the book? If anyone wants to check out some pictures from the artbook, I've a review on my blog. Amazing stuff Phil. Love it. I spent about $80 USd to get the art of iron man book cuz I can't get it in China. Had to paid 110% shipping for the price of the book. To me its worth it. It is good to see all of these made it to the 4 inch toy line by HASBRO.